Renee Young Traveling Without Roster In Saudi Arabia, Photos & Video Of Top WWE Stars Arriving, More - Wrestling Inc.
Several WWE Superstars have been doing media appearances in the Kingdom of Saudi Arabia today to promote Friday's Crown Jewel event in Riyadh. PWInsider reports that The Undertaker, WWE Hall of Famer Shawn Michaels, Brock Lesnar and others are scheduled to have dinner with representatives from the Saudi government tonight. Regarding Renee Young being on the announce team for Crown Jewel, word is that she was given special travel arrangements and accommodations while she's in the country. She will not be traveling with the rest of the roster. There's no word yet on if Renee will be placed in front of the crowd or if her role on the show means that the announcers will call the action from elsewhere in the stadium. Michael Cole, Corey Graves and Byron Saxton are also there but there's no word yet on if there will be a four-person announce team or if Saxton will handle interviews. Regarding production for the event, John "Big" Gaburick has been in the Kingdom for more than a month to work on planning and logistics. Producers brought in to plan the event are Billy Kidman, John Laurinaitis, Adam Pearce, Ranjin Singh and WWE Hall of Famer Michael "PS" Hayes. WWE brought Greg Hamilton to the Kingdom to handle ring announcing duties for Crown Jewel. Mike Rome was scheduled to make the trip at one point but he's not there. On a related note, Lio Rush made the trip and will be in Bobby Lashley's corner for the first round World Cup tournament match against WWE Intercontinental Champion Seth Rollins. The Kingdom's General Sports Authority and their Center for International Communication tweeted these clips of various Superstars arriving for Crown Jewel, including Rollins, Michaels, Lashley, Acting RAW General Manager Baron Corbin, Drew McIntyre, Dolph Ziggler, WWE Champion AJ Styles, The New Day, SmackDown Tag Team Champions The Bar, Braun Strowman, Jeff Hardy, Rey Mysterio, Big Show, Randy Orton, The Miz, Dean Ambrose, WWE Hall of Famer Kurt Angle and The Undertaker, among others. As we noted earlier, WWE Hall of Famers Hulk Hogan and Jimmy Hart also arrived together. Hogan will be hosting the show. Angle spoke to the media and commented on how WWE will continue to come to the Kingdom. Ambrose spoke of the quick sell-out of the event and how WWE will keep coming back for their fans. McIntyre also spoke on WWE's future with the Kingdom. "I think considering the last show and how big it was and how quick the tickets sold out for this one, the only way to go is up, and up, and up," McIntyre said. "We're just going to keep growing and our relationship with the Saudi WWE Universe is just going to get as big as possible. I don't see a limit, to be honest. I think it's very exciting, that it's because of the fans' interest, is why we're back so quick and as long as the fans want us here, we want to be here." ?? WWE champions arrive to Riyadh in preparation for tomorrow's international event at King Saud University Stadium. ???? 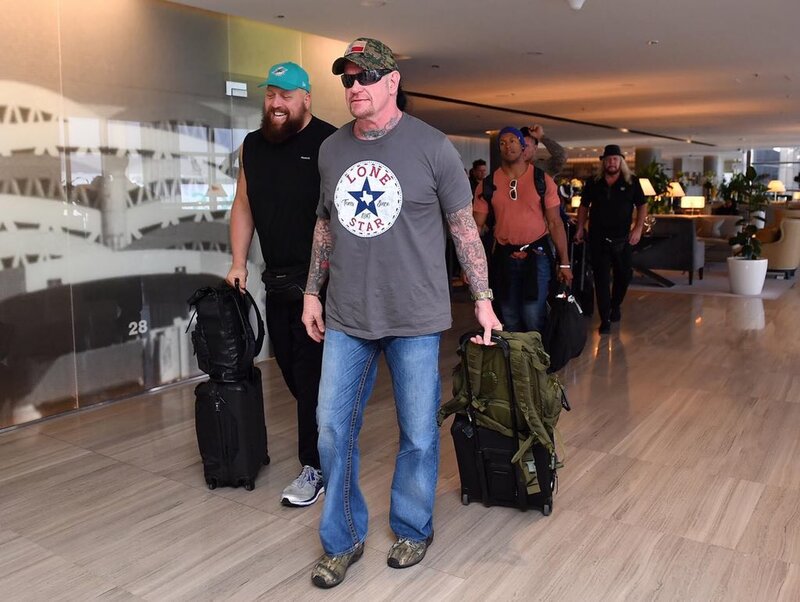 WWE champions arrive to Riyadh in preparation for tomorrow's international event at King Saud University Stadium.